Mobiles are a great way to add a splash of color to an area of a room that would ordinarily be void of decoration. By hanging a colorful mobile from the ceiling, you can instantly fill the space with a bit of cheer. 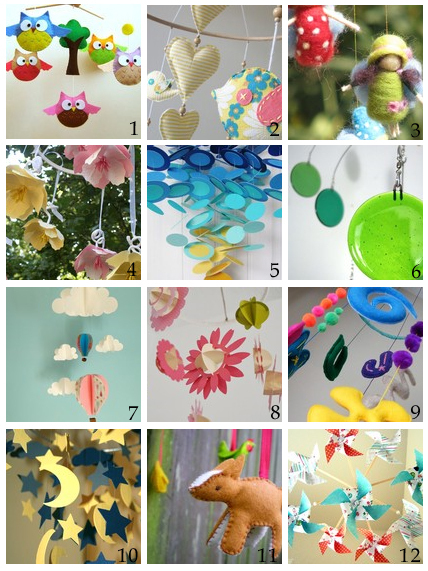 And with the variety of handmade options available, you're sure to find a mobile to fit with the style and colors of your decor. Here are some of my favorites. The mobiles look very nice. One great tip, though, I learned from a midwife: Most mobiles are only designed for the parents, not the kids who do NOT see them FROM THE SIDE, but from BELOW. Some mobiles take that into consideration now (even cheap IKEA ones) and look good from below and the side. Worked really well for my baby.